Detailed coordination and a unique location lead to construction of a new headquarters that promotes employee satisfaction and collaboration. Client Name: The Andersons, Inc. 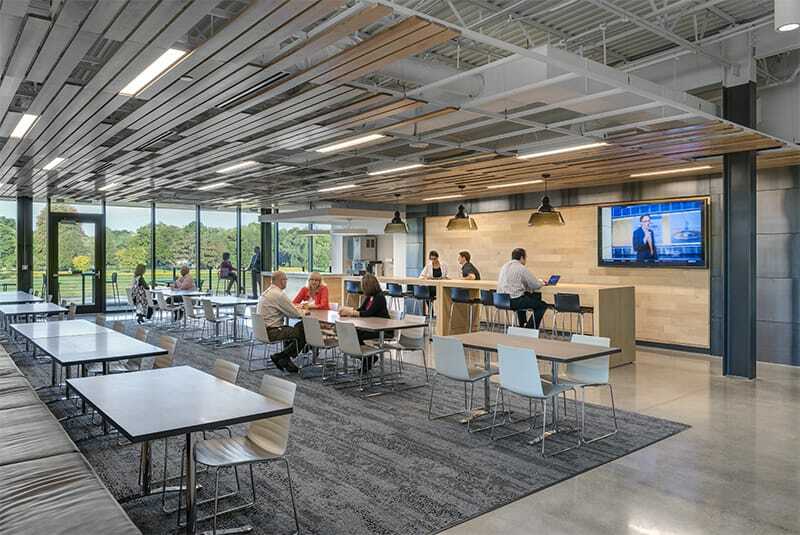 The new state-of-the-art, 141,131 SF corporate headquarters for The Andersons, Inc. features an open layout with collaborative spaces and unique brand touches. 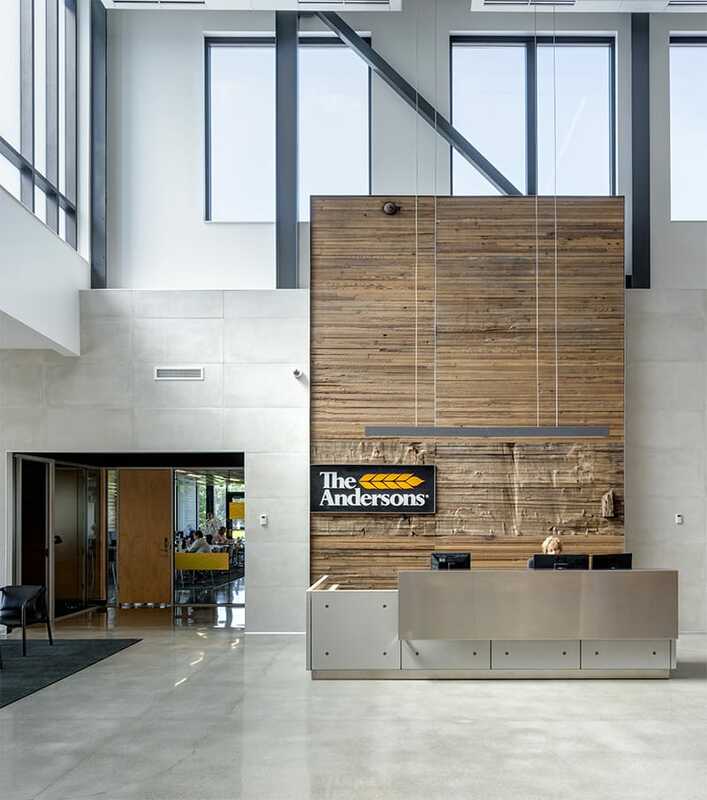 Implementing a more open, collaborative environment was a key goal of this new facility to seamlessly connect the multiple divisions within The Andersons. 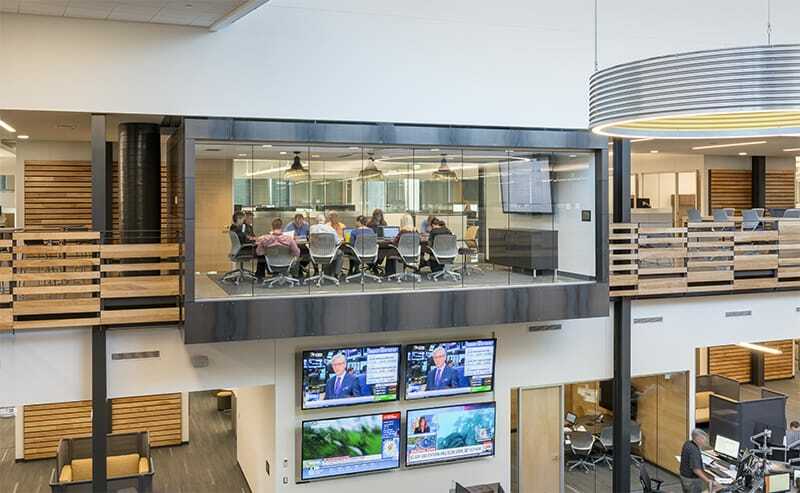 Gilbane completed the project on schedule and under budget, delivering a modern headquarters facility that exceeded the clients’ expectations and provided a new home for employees in which they are proud to work. 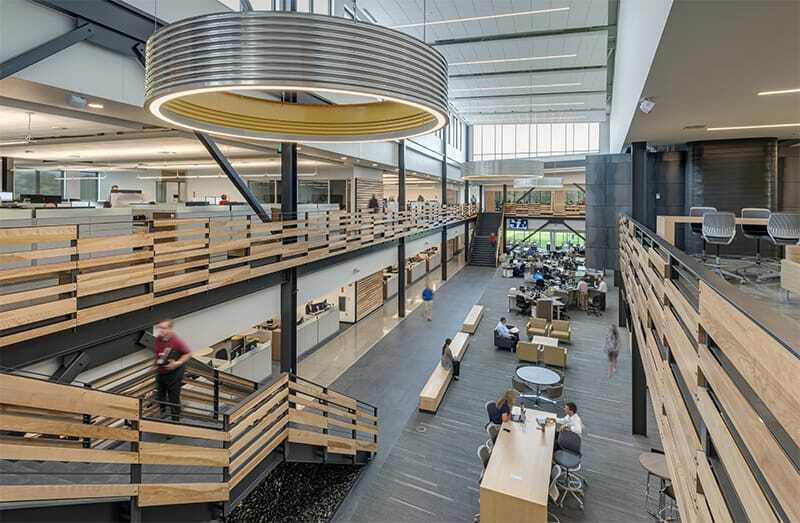 The new headquarters building enhances and encourages a culture of collaboration with features such as sit-to-stand desks, natural daylighting and unique branding throughout the inviting layout. A large piece of reclaimed, grain-washed wood is featured as a statement piece on the lobby wall. This feature was sourced from the mill that was operated by The Andersons founder’s father and is a unique nod to the company’s heritage. To improve functionality and design, the team devised several value engineering approaches and suggested multiple design enhancements at no additional cost. A significant enhancement included relocating the weld to the horizontal slats so they would not be exposed. This feature added both aesthetic value and provided a higher quality finished product. Having previously been a 63-acre plot of land that operated as a golf course, the team extensively developed the site to include the new headquarters, 1.5 miles of walking trails, special landscaping and native prairie grass fields. Gilbane forged a strong relationship with The Andersons, Inc. from the onset of the project. The team supported the preconstruction phase to assist with project decisions and establish milestone dates to accommodate the fast-track schedule needs. Additionally, Gilbane assisted the owner in the selection of an architect through a competitive design selection process. The team also provided the owner with training on how to utilize Bluebeam, which not only made electronic file sharing easier, but also ensured the owner was involved in all aspects of the project. As a result of the team’s proactive management efforts, 100% of the project’s contingency costs were returned to the owner after construction was completed. “Gilbane’s professional and partnering approach to construction management services are directly related to the success of our project. The core team that Gilbane provided was extremely professional, knowledgeable and committed. This approach enabled the project to be completed safely and under budget, despite an accelerated timeline. Any issues that were encountered over the course of the project were quickly resolved. Their team’s ability to quickly respond to changing conditions and situations is largely due to their experience and dedication toward keeping their client’s best interests in mind. The relationships developed with the Gilbane team allowed for excellent communication and an invaluable partnership throughout the project.” – Steve Bell, Director of Engineering, The Andersons, Inc.